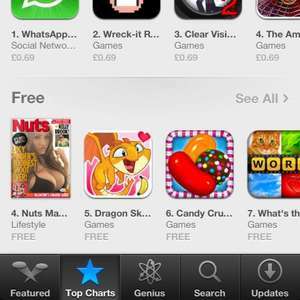 Get a free copy of NUTS magazine via the apple App Store. Not sure if on android systems. I don't know how to set up a link but its fairly easy to find. I don't read any type of these magazines nor buy them. I am strictly looking at the reviews. Apparently it isn't the "full monty" meaning it isn't the same as the in-store paper copy due to Apple's "no-pr0n" App Store rules. Hot I guess for freebie but like I said, I don't read 'em. If it's in the App Store, it wouldn't be. But anyway, I just don't find these sorts of magazines amusing any more, they used to have lots of witty humour, now it's rubbish. I don't read any type of these magazines nor buy them. I am strictly … I don't read any type of these magazines nor buy them. I am strictly looking at the reviews.Apparently it isn't the "full monty" meaning it isn't the same as the in-store paper copy due to Apple's "no-pr0n" App Store rules.Hot I guess for freebie but like I said, I don't read 'em. I don't read them either, I just peruse the pictures.